Dry ice helps bring the Halloween spirit alive and impress your guests with dazzling drinks and spooky features. But when handled incorrectly, it can cause danger and damage to those around it. When buying in-store, you may ask an employee to pick up the dry ice for you for further safety precautions. Prepare and think ahead before purchasing your dry ice in order to ensure it lasts longer, and prevents unwanted accidents. 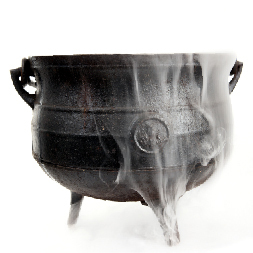 Plan to buy enough dry ice, for if it is not handled correctly, it will sublimate and lead to loss of the product. To avoid this, bring a cooler or cardboard box to insulate the dry ice from being exposed to warmer temperatures. In addition, you can use a blanket or sleeping back to wrap around your choice of container to protect it from the changing temperatures. Set the bag of dry ice inside your container and close the lid without sealing. This is very important avoid safety hazards. The dry ice will sublimate from solid to carbon dioxide vapor, and the gas could build up and cause an explosion without room for it to escape. Make sure the new air circulates in your vehicle to prevent carbon dioxide poisoning when transporting it. The best way to store your dry ice is in a cooler (make sure this is not sealed as well). You may add insulation by double bagging the dry ice in paper bags and then wrapping a blanket around the cooler. Avoid putting in a fridge or freezer. The cold temperature could cause your thermostat to turn your appliance off, and force open the door. Always use gloves, tongs, or another device to handle the dry ice. Make sure there is good air circulation where you are using it. If used in drinks, make sure to not ingest the dry ice fragments. This can cause tissue damage from frost bite. Dry ice sinks in a bowl or glass, so the risk of ingestion can be low if used correctly. Avoid using in alcoholic cocktails or while intoxicated. Never leave dry ice unattended around children or pets. Be aware of the symptoms of carbon dioxide poisoning, and always make sure there is good ventilation. If using dry ice to chill your food, the best results will come from storing it on top of the food as the ice will sink. Avoid putting dry ice directly onto counter tops of empty glass containers, the cold temperatures could cause the material to crack. Once you have followed the precautions above, bring your Halloween party to the next level with dry ice galore! 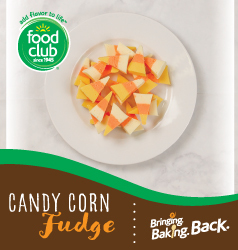 It’s not corny- enjoy this Food Club® Candy Corn Fudge recipe. Use an 8×8 pan by lining it with wax paper. Place 2/3 cup of white chocolate chips in a microwave until melted. Stir every 15 seconds until chocolate is no longer bumpy. Add /3 of the frosting and a few drops of yellow food coloring. Stir to combine. Pour into pan and refrigerate until solid. To serve, cut the fudge into 1-inch triangles. Carving your Halloween pumpkin is a big part of the holiday. Unfortunately pumpkins don’t last forever and your masterpiece that you spent hours, days – let’s be honest you’ve been planning this carving since last Halloween – will start to droop and wilt within a few days. 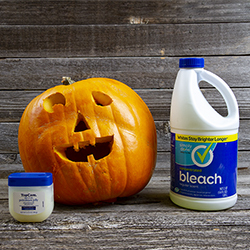 Luckily, we have a few tricks to keep your Jack-O-Lantern looking fresh! Step 1 – Do not cut the top of your pumpkin off! Cutting of the stem will dramatically decrease the life of your pumpkin. Instead, cut off the bottom or the back of your pumpkin. Step 2 – After you have completely cleaned out the inside of your pumpkin, make sure you save the seeds to bake later, clean your pumpkin with a bleach water mixture. Mix together 1 tablespoon of bleach per quart of water and use to clean the inside and outside of the pumpkin. Step 3 – Let your pumpkin dry completely before setting outside or carving! Once it is completely dry carve your masterpiece. Step 4 – Once you have finished your carving, spread petroleum jelly on all of the surfaces that have been carved, including a light spread on the entire inside of the pumpkin. Step 5 – Place your pumpkin on display for all of the trick-or-treaters to admire. If your pumpkin does start to wilt submerging it in an ice bath for a couple of hours can help refresh it. Reapply petroleum jelly. Ace Rewards members save 20% off everything that fits in the sale bag this Saturday and Sunday, November 3 and 4. If you’re not an Ace Rewards member, join today to take advantage of this great deal, along with monthly coupons, sale notifications and home maintenance tips. Visit us in Draper, Murray, Olympus Hills and Sandy to join today. Salt Lake City, UT (October 24, 2018) Happy Shopping has reached Draper in the form of a new Macey’s store. The new store opened today, replacing Honey Bee Produce Company that was previously in the 1212 Draper Parkway location. To celebrate the new Macey’s, several activities will be held this weekend. The Draper store is the 13th Macey’s location in Northern Utah. The chain, owned and operated by Associated Retail Operations, a subsidiary of Associated Food Stores, has stores from Cache Valley to Utah County. To learn more about Macey’s and to find the location nearest you, visit www.maceys.com. In 1947, Walt Macey and Dale A. Jones started the “Save-A-Nickle-Market” in Rosepark, Utah. Macey’s grew from a small store into a multi-store chain by providing personalized old-fashioned service. Known for their famous doughnuts and Kong Kones, Macey’s grocery stores offer an in-store bakery, delicatessen, full-service grocery, meat, produce and non-foods department and above all, friendly service. 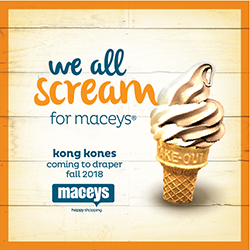 For more information visit maceys.com. 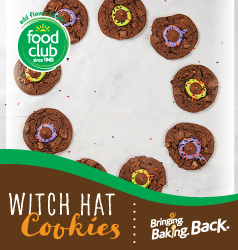 Brew up these tasty Food Club®  witch hat inspired cookies. Bake 12 cookies as specified on the cookie dough package instructions. While waiting for the cookies to bake, mix half of the frosting with the purple food coloring and the other half with the green food coloring. Load both frosting colors into a piping bag with a 1-inch tip (hint: you can use a plastic baggie if you do not have a piping bag). 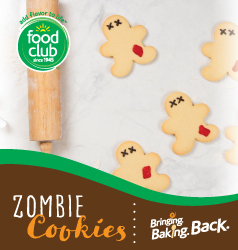 After the cookies have cooled completely, pipe a half-inch of purple or green frosting onto the center of the cookies and top with a triangular chocolate morsel and sprinkles. 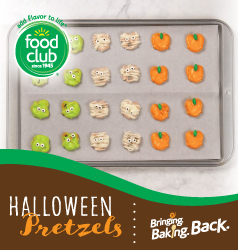 Enjoy a deliciously frightful treat with Food Club® Halloween pretzels. Take three glass bowls. Melt 1 cup of chocolate chips in each bowl via your microwave oven, 2 minutes each, stirring occasionally. Add food coloring. Dip pretzels in chocolate using two forks. Add sugar eyes.